Act One: Clemson Football Head Coach, Dabo Swinney, offered an amazing "poll party" with pizza for everyone if Clemson makes the College Football Playoffs in the last poll of the season. See the written news story here. See the news video clip of the press conference below. You might have to establish the context and vocabulary a little for some students. "Death Valley" in this case refers to the stadium where Clemson plays home football games. The polls are similar to polls in politics, like votes. In this case the votes are from a panel of coaches voting for the top four teams in college football. What do you wonder? What questions do you have? - How many pizzas will it take to feed everyone in the stadium? How much will it cost to feed everyone in the stadium? How long would it take to make all those pizzas? Is it even possible? Act Two: What information would be useful? 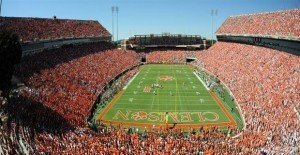 - Death Valley stadium info & total capacity. A menu for Peppino's, which is a pizza place near the campus. You can also use this "How many pizzas do you need to buy" calculator at; http://calculate-this.com/how-many-pizzas-buy-calculator Act Three: A possible solution from ESPN for the number of pizzas necessary. And a possible solution for the cost from ESPN. You can see the whole article from ESPN here. This activity address modeling with math, estimating, and can serve as a great way for students to reason, problem solve and communicate mathematical thinking while practicing division and multiplication with decimals and/or considering area of circles (pizza). This activity could span a number of grade levels. Kids are estimating, reasoning and working with rational numbers CCSS: 5.NBT.7, 6.NS.3, 7.NS.3, 7.EE.3. Could also address area of circles as students consider pizza sizes: 7.G.4. Finally, this is a great activity for high school students to engage in modeling and practice basic operations with rational numbers. It is also very likely that students will engage in the following math practices: MP1, MP2, MP3 and MP4. ← What’s your favorite sport?